End-unit ranch style home with vaulted ceilings and a main floor master suite, spacious 5 piece bath and a huge walk-in closet! Large 2nd bedroom right next to the main floor full bathroom on the front end of the home giving privacy. Tons of natural lights comes through the large windows throughout the home. Main level kitchen and living room with gas fireplace, open floor plan and island seating. This kitchen is spacious! Plus multiple counter spaces for the cook or host. 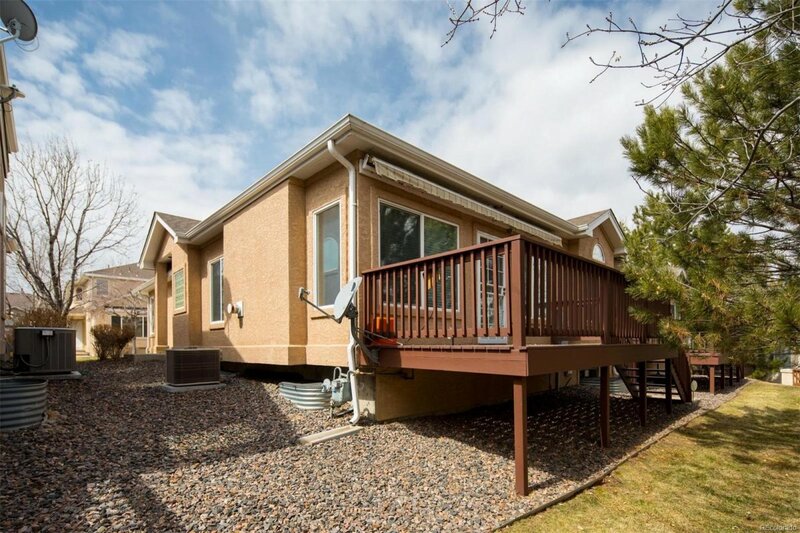 Must see this deck right off your living room, perfect for hosting or relaxing, lined with trees and greenery and a gas grill hookup. Spacious full basement with large windows and new carpet. Easily add in a bedroom or two, there's plumbing ready for a bathroom, rec-room, office, storage, anything you can dream of with room for an additional bathroom. Plus guest parking right out back. All of this and just 5 minutes from Cherry Creek State Park, shopping and dining. Cherry Creek school district and close to I-225.